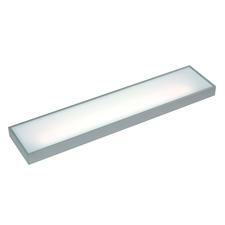 LED Shelf Lighting is the perfect way to add indirect lighting softness to the room and it can also create a feature in the room too. With our range of shelves, we guarantee to have what you need to create a lighting effect that’s stylish and modern within your home. With different shelf lengths available and different light offerings, there’s bound to be a design to suit your needs and budget. Shop the range below and illuminate specific parts of the wall with a fantastic supply of shelf lighting. Getting the right level of light in your home is vital for the safety of you and your family, so you can move around with ease, and LED Glass Shelf Lighting is the perfect unobtrusive way of adding soft and ambient lighting to the room. These lights look great in the bathroom, helping to create a calming oasis of soft light, and they’re perfect to add extra brightness to the kitchen too, as well as this they’re perfect to shine light on specific ornaments and features in the home. With the development of LEDS, the options to create different shelf lighting effects, due to the low heat and size, offers you a wonderful tool. Plus, they’re a lot more affordable and economical too. 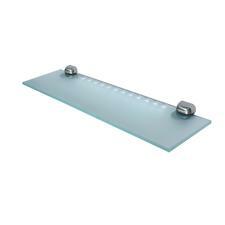 The Verona Illuminated LED Light Shelf is available in white or blue, which makes it the perfect option for the bathroom. The backlight design of this shelf adds depth to the room, and it looks great when there is a combination of objects, particularly glass, as the light shines through. And we particularly love the Sirius LED Glass Corner Shelf light which is a lot less intrusive and doesn’t demand much space from a room. 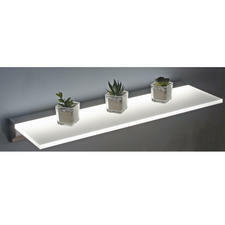 Perfect for housing plants or photo frames, this shelf looks contemporary and chic. The Venice and Verona designs are lot more slim in design when compared with the Major LED Illuminated Box Shelf Light, but this makes a great feature on the wall. It comes in three available lengths and is perfect to make a design statement in any room, whether you use it as a storage space or just as a lighting feature on the wall. 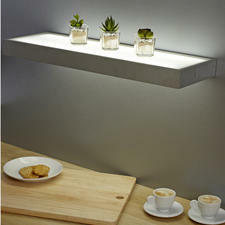 With LED shelf lighting you manage to avoid the harshness of other lighting styles. These types of fittings can offer a warm glow, offering a welcoming and cosy feel to any room. Shop the range from First Lighting now.